Dips are a favorite at my house. We tend to make a dip into a dinner. This is my husband, and my favorite dip. It goes together quickly, heats up in the slow cooker, and tastes delicious! 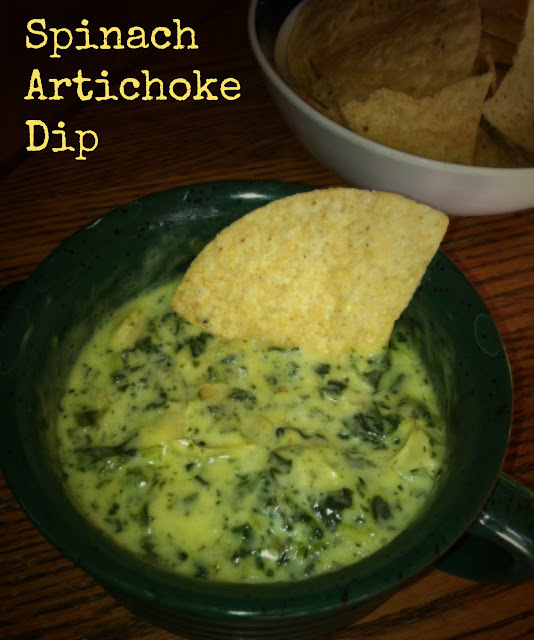 Spinach artichoke dip! This one is a wee different than most versions of this dip. There is no mayo, cream cheese, or sour cream in it. That's right. It is cheesy, has a bit of a spice, and tastes wonderful! Boil a saucepan of water and quickly heat the spinach, and drain well. (I do this because if I don't boil it first, the spinach gets the dip really watery and a very green tint). Break up the pepperjack cheese into the slow cooker. Pour the entire jar of alfredo sauce over the pepperjack cheese. Drain artichoke hearts, and chop coarsely. Put the drained spinach over everything. Mix well. Cover and let cook for an hour and half or so, or until the pepperjack cheese is well melted. Serve with tortilla chips, pita bread, toasted garlic bread...anything you would like to dip into this wonderful dip! !